Blackheads are a common problem which many patients try to remove by squeezing their skin causing unnecessary trauma to the affected area. They are a non-inflamed acne lesions. If they are not clearing with the suggested treatments seek advice from a dermatologist for appropriate acne treatment. Blackheads are one of the lesions seen in acne prone skin. One of the problems in patients with acne is that the follicular lining builds up layers of cells (keratinocytes) which effectively block the opening of the follicle (pores). 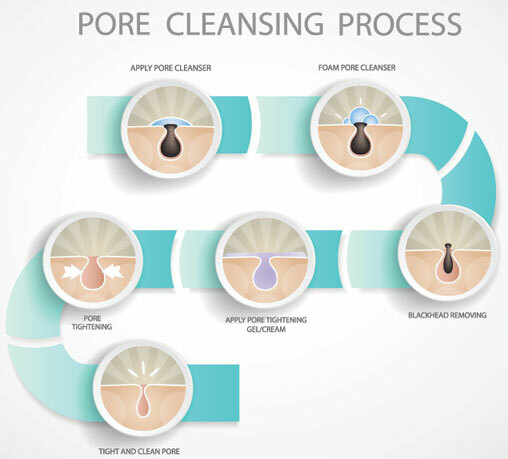 The material that is squeezed out of a blackhead is a mixture of sebum from the sebaceous gland mixed with keratin and other cellular materials. So black heads are blocked pores.The black colour is due to the oxidation of the contents of the follicle at the surface of the skin giving it a black appearance. Here are some common questions that people suffering with blackheads often raise. How are blackheads / ingrown hairs different to pimples? Blackheads are one form of pimple. Often when we refer to pimples we mean red spots. These red acne spots usually start off as either open or closed comedones (blackheads or whiteheads). When these comedones become inflamed they the form inflamed papules or red spots commonly known as pimples. How can people prevent developing blackheads? Cosmetic treatments such as chemical peels may help with the treatment of blackheads. If cosmetic approaches fail prescription retinoid gels and creams can be effective in treating blackheads. What is the best step-by-step method to squeeze a blackhead? Squeezing a blackhead can potentially excessively traumatise the skin leaving temporary redness or pigmentation. It is best to use a comedone extractor which can be bought online or in a pharmacy. Wash the face first then pat it dry and use the comedone extractor to put pressure on the border of the comedone effectively pushing the contents out onto the skin or onto the extractor. This can be repeated until the follicle is empty. What is the best aftercare once you have squeezed a blackhead? After extracting the comedone apply a moisturiser to the area to settle any inflamation caused by trauma to the skin. Do not apply products with salicylic acid or glycolic acid until the following day.